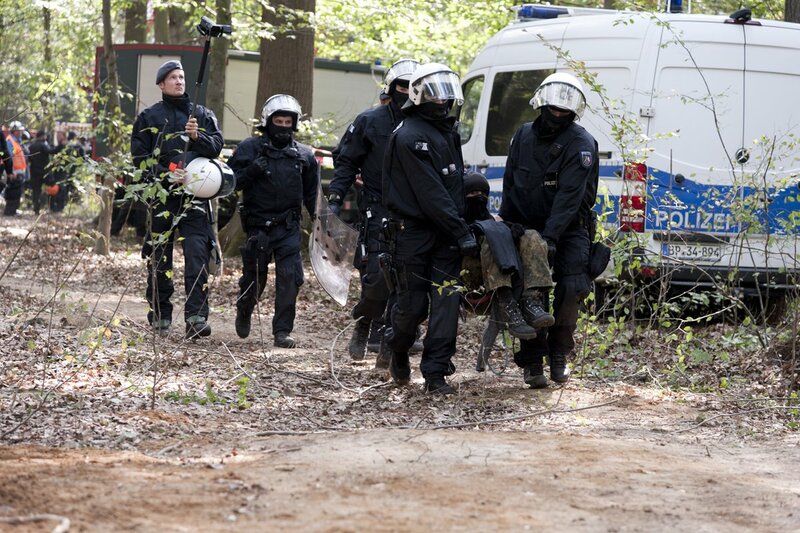 Hambacher Forest, September 15: Today the eviction of the occupation in the 12,000 Hambach forest continued. In the northernmost occupation, fittingly named “The North”, police brutally destroyed the homes of the climate-justice activists, which had locked themselves on in order to delay the demolition of the treehouse occupation. Originally published by Hambi Bleibt. Image by Twitter account @HambiBleibt . Already early in the morning, news about an apparent solidarity action at the Niederaußem coal-power-plant reached us. Here activists erected a tripod, with the banner saying “Hambi bleibt!” (Hambi stays! ), and locked on to a conveyor-belt transporting lignite, as well as occupying 3 diggers. This successfully led to the power-plant being brought down to around 20% of its normal capacity. In and around the occupation, solidarity was also clear to be seen.